In the last post, I showed you the steps to get your first time client to fill out an online survey of their experience, and then move them to share your salon on social media. In order to do this, you give them an incentive like $5 off their next appointment. Once they click the social share button, your salon website appears on their Facebook (or Twitter or Google+) status update. Simply because people believe what their friends say. If a friend recommends a hair stylist, many other women are sitting at home looking at their news feed, wondering if their friend found a better hair stylist. And they will give you a phone call. Social proof is kind of like positive peer pressure. What Does Google Think Of Social Proof? It loves it! Not only does a social share make client’s friends believe you are a great salon, it makes Google think you are a great salon! The more social engagement your website gets (likes and shares), the more Google thinks it is an important website, which is a key factor in ranking your website in search. To recap the Salon Profit Circle, a new client finds your salon, and schedules an appointment. The next day, an automated email follows up, and asks them to participate in a short online survey. When they submit the survey, it redirects them to another page on your website that offers $5 off their next appointment if they click the social share button. When they click the social share button, it unlocks $5 for their second appointment, and shares your salon website on their social media status. Their friends see the social media post, give you a call, and the circle continues over, and over and over again on autopilot! 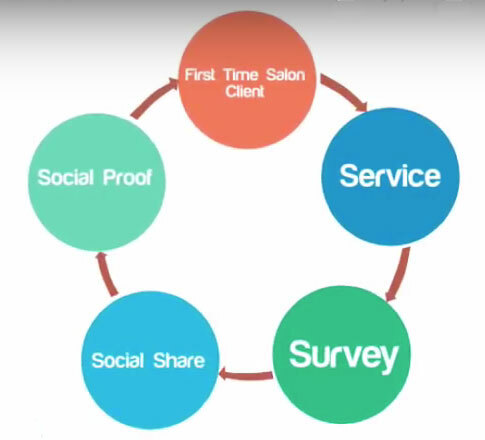 There are different ways and tools you can use to accomplish the Salon Profit Circle. I have found that the easiest way to automate the process, is by using Rosy Salon Software’s automated email responder, and a survey on your salon’s WordPress website. Finally, for the social share, I use a plugin from Code Canyon. Search for the WordPress plugin called Social Locker. If you want to implement the Salon Profit Circle in your salon, but wouldn’t know the first thing about setting it up, I would love to help! Just fill out the form below, and I will get in touch with you to set it up. This entry was posted in Salon Profit Circle and tagged salon growth, salon profit circle, social proof, word of mouth advertising. Bookmark the permalink.